Chromium (Cr) (atomic number 24 and atomic weight 52.01) has density of 7.1 gm/cc. 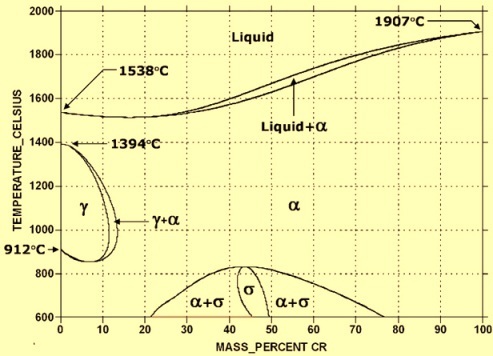 Melting point of Cr is 1850 deg C and boiling point is 2680 deg C. The phase diagram of the Fe-Cr binary system is at Fig 1. Cr has got a body centered cubic (bcc) crystal structure. Around 85 % of the chromite (chrome ore) mined is used in metallurgical application, namely stainless steels, low alloy steels, high strength alloy steels, tool steels, some maraging steels (high strength alloy steels of the precipitation hardening type), and high performance alloys such as chromium-cobalt- tungsten (or molybdenum) alloys, nickel-chromium-manganese-niobium-tantalum (or titanium) alloys, nickel-chromium-molybdenum alloys, and cobalt-chromium alloys. Cr is the most versatile and widely used element in alloying of steel. It is a key component of stainless steels. Around 70 % of Cr used in steelmaking goes into the production of stainless steels. Consumption of Cr in the constructional alloy steels comes next. Most of the constructional alloy steels contain Cr less than 3 %. Tool steels, super alloys and other specialty steels, though have higher in Cr content account for lower consumption of Cr since these steels are produced in smaller quantities. Cr in the steel comes either from Cr containing scrap or from ferrochrome (Fe- Cr) during the production of Cr alloyed steels. Fe-Cr used in steel making are commercially available in several grades . The main impurities in Fe-Cr are carbon (C) and silicon (Si). Low C grades are costlier than the high C grades. The widespread shift toward duplex refining practices such as the AOD, CLU, etc., for the production of stainless steels has resulted into the increased use of high carbon Fe-Cr. Low carbon Fe-Cr is now used mainly for final chemistry adjustments only. Another low carbon Fe-Cr used is ferrochrome silicon. It is used in the electric arc furnace (EAF) to maintain Si levels in the bath for preventing Cr oxidation and for final adjustments of Cr. High carbon Fe-Cr also commonly known as charge chrome remains the most widely used Cr addition. High carbon Fe-Cr normally contains 6 % to 8 % C and 65 % to 70 % of Cr. Charge chrome is generally available in two Cr ranges (i) 63% to 67 % with C content of around 5.5 % and (ii) 50 % to 55 % with C content of a maximum of 8 %. Si in the Fe-Cr is normally in the range of 2 % to 4 % depending upon the C content. C and Si have an inverse relationship during the production of Fe-Cr, i.e., high C with lower Si and vice-versa. Cr containing HSLA (high strength low alloy) steels, ferritic stainless steels and even some tool steels may be produced in the BOF using a charge of hot metal, scrap and alloy addition agents, including charge chrome. Cr recoveries are usually 90 % or greater. In all practices, however, proper selection of charge materials, careful process control (particularly with regard to slag chemistry) and precise analytical techniques helps in maximum recovery of Cr. Special care need to be taken during rolling of high Cr and chromium-nickel (Cr-Ni) stainless steels as their behavior is quite different from plain C or low Cr alloy steels. Thorough surface conditioning is important. Heating need to be performed slowly since stainless steels have considerably lower thermal conductivity than plain C steels. Rapid heating can lead to surface burning. Soaking is to be generally performed above 1150 deg C but specific ranges vary with the grades of the steel. Overheating is to be avoided since excessive grain growth (to which the stainless steels are particularly sensitive) can lead to difficulties in rolling. Ferritic and martensitic stainless steel grades (400 series) can be hot rolled rather easily. Austenitic grades of stainless steels (300 series), on the other hand, are stiffer at high temperatures than C or alloy steels and exert greater roll stresses for equivalent reductions. Stainless steels are cooled at normal rates after hot working but the air hardening martensitic grades need to be cooled slowly to avoid the likelihood of thermal cracking during subsequent conditioning if applicable. All stainless steels are annealed before cold rolling. Cr is not a strong hardenability agent as compared to some other elements such as manganese (Mn) or molybdenum (Mo). However, it is very cost effective (degree of hardenability increase/relative cost of alloying element). Cr is a constituent of almost all of the alloy steels as specified by AISI (American Iron and Steel Institute). Cr has also a strong tendency to form hard and stable carbides. This property gives Cr steels the ability to resist softening during tempering and makes the tempered Cr steels hard and wear resistant. However, it also means that for a given hardness level, Cr steels need higher tempering temperatures, or longer tempering times, than the plain C steels. This effect increases with increasing Cr content of the steel. Tool steels, and alloy steels containing significant quantities of carbide forming elements such as Cr, need higher austenitizing temperatures in order to dissolve the carbides completely. As in the case of stainless steels, Cr has a tendency to promote grain growth. Hence careful control of austenitizing temperatures is important in Cr containing alloy and tool steels. Presence of vanadium (V) in some of the Cr steels counteracts this phenomenon. Cr and Ni-Cr alloy steels are particularly susceptible to many heat treatment related embrittlement mechanisms. Hence care is to be taken to avoid them. Temper embrittlement is the loss of ductility (or increase in ductile-to-brittle transition temperatures) after tempering in the range of 375 deg C to 575 deg C or slow cooling through this range. It is now known that it is related to impurities such as phosphorus (P), tin (Sn), arsenic (As) and particularly antimony (Sb). Unless special care is taken, these impurities are invariably present in sufficient concentrations in Cr steels to cause damage. The presence of more than 0.5 % Mo retards but does not eliminate the embrittlement. Unless otherwise impossible, as in the slow cooling of large forgings or castings, care need to be taken to avoid the dangerous temperature range. ‘350 deg C embrittlement’ is the loss of room temperature impact toughness after tempering to high strength levels, i.e., in the temperature range of 200 deg C to 370 deg C. Aluminum (Al) has tendency to reduce this problem, but Al content of 0.10 % is needed to eliminate it completely. In martensitic stainless steels, the critical temperature for embrittlement is increased to around 480 deg C.
‘500 deg C embrittlement’ is found in high Cr ferritic stainless steels that have been held in the damaging temperature range of 400 deg C to 500 deg C for very long periods of time. However this problem does not exist in steels containing less than 15 % Cr. This problem can be eliminated by heating to temperatures above the embrittlement range for several hours. Sigma phase embrittlement results from the precipitation of the iron-chromium compound after holding austenitic or ferritic stainless steels for long periods of time in the temperature range of 560 deg C to 980 deg C. Slow cooling from the temperature range of 1040 deg C to 1150 deg C produces the same effect, as does quenching from this range followed by subsequent heating in the temperature range of 560 deg C to 980 deg C.
Cr increases the hardenability of steel while there is a minimal effect on the ductility. Cr by forming carbides increases the edge holding quality of steel. The tensile strength of steel increases by 8 to 100 N/sq mm for every 1 % of Cr added. The yield strength also increases but the notch impact value reduces. Cr is normally added to steel for increasing oxidation resistance, and for improving high temperature strength. Corrosion resistance of Cr steels increases sharply at a Cr level of greater than 12 %. Cr forms a very coherent oxide layer on the steel surface that prevents further oxidation and thus provides resistance to corrosion in the steels. As a hardening element, Cr is frequently added with a toughening element such as Ni to produce superior mechanical properties. At higher temperatures, Cr contributes increased strength. Cr is strong carbide former. Complex chromium-iron carbides go into solution in austenite slowly and hence sufficient heating time is required to be provided before quenching of these steels. The strong carbide forming property of Cr is an essential factor for its behaviour as a strong second phase particle. It, therefore, obstructs the dislocation motion particularly at elevated temperatures. Also Cr is a nitride former and is used in nitriding steels. As with Mn, Cr has a tendency to increase hardness penetration. In fact Cr has many interesting effects on steel. When 5 % Cr or more is used in conjunction with Mn, the critical quenching speed is reduced to the point that the steel becomes air hardening. Cr can also increase the toughness of steel, as well as the wear resistance. Probably one of the most well known effects of Cr on steel is the tendency to resist staining and corrosion. Steels with 14 % or more Cr are referred to as stainless steels. A more accurate term would be stain resistant steels. Stainless tool steels will in fact darken and rust, just not as readily as the non stainless varieties. Presence of Cr in some steels can cause excessive hardness and cracking in and adjacent to welds. The properties that distinguish stainless steels i.e. Fe-Cr-(Mo) alloys and Fe-Cr-Ni-(Mo) alloys from other corrosion resistant materials depend essentially on Cr. The high degree of reactivity of Cr is the basis for the effectiveness of Cr as an alloying element in stainless steels. The resistance of these metallic alloys to the chemical effects of corrosive agents is determined by their ability to protect themselves through the formation of an adherent, insoluble film of reaction products that shields the metal substrate from uniform and localized attack. The protective film called passive layer or passive film. It is a very fine layer on the surface, of the order of 1.0 to 2.0 nm, which reduces the corrosion rate to negligible levels and has a structure similar to chromite. For passivation to occur and remain stable, the Fe-Cr alloy must have a minimum Cr content of about 11 % by weight, above which passivity can occur and below which it is impossible. The corrosion resistance of Fe-Cr alloys tends to improve as the Cr content is increased, and definite changes happen at about 11 % Cr, and again around 17 % Cr. Type 409 is the most popular of the ferritic stainless steels, and has been widely used in automotive exhaust systems and fuel tanks. In the absence of Ni, it is less expensive than the austenitic grades. Type 410, a martensitic grade, and its lower Si modification, type 403, are extensively used for steam turbine blading and for such mechanical uses as valve parts, pump components, shafts and screens. Cutlery is manufactured from type 440C, a martensitic stainless high in both Cr and C.
Cr up to about 1 % is found in most standard alloy steels. Some Bearing steels contain up to 1.5 % Cr. Carburizing and nitriding steels contain Cr since Cr has a strong affinity for both C and N (nitrogen). Here, Cr is normally used in combination with other strong carbide or nitride formers such as V, Al and Mo to form thin but extremely hard nitrided cases. Cr improves the resistance of steels to H (hydrogen) attack. Cr and Cr-Mo steels have long been standard materials in applications where H bearing atmospheres are present such as petrochemical plants, petroleum refineries, power boiler tubing, etc. It is believed that Cr carbide, being stable at elevated temperatures, resists the strong reducing power of H present in these environments. The presence of Cr carbide also gives structural steels the ability to resist softening at higher temperatures. This leads to greater creep and stress rupture resistance. Steels selected for high temperature service contain increased amounts of Cr and Mo depending on the expected service temperature. Cr contents may range from a minimum of 1.25 % to the maximum values found in austenitic stainless steels and high temperature/corrosion resistant alloys. Cr is the most important element in tool steels, after C. Besides imparting hardenability, Cr forms a variety of carbides (depending on composition and heat treatment). These carbides, along with those of V, Mo and other constituents, provide the necessary wear and abrasion resistance. As mentioned above, Cr does have a tendency to promote grain growth, and since most tool steels require high austenitizing temperatures, V is frequently added as well.